The Urban Redevelopment Authority (URA) announced on Nov 15 that new private homes sales fell 36 per cent in October from a year earlier, and that there was hardly any new launches in the month. The URA data showed that excluding executive condominiums (ECs), developers sold 487 units last month. This is a sharp drop in new private homes sales when compared with 761 units in October 2017. On a month-on-month basis, new private homes sales fell by about 48 per cent in October from the 932 units sold in September. The URA statistics showed that a total of 202 new homes were launched by developers last month, which is an 83 per cent drop from the 1,169 units launched in September. Ms Tricia Song, Colliers International’s Head of Research for Singapore commenting on the new private homes sales for October 2018 noted that the recovery in September appears to be short-lived as developers’ new private homes sales tumbled in October in absence of major new launches. Just 202 new units were placed for sale during the month, the lowest since 201 units were launched in February this year. The meagre number of new units launched last month was unsurprising given that developers had put 1,169 units on the market from six non-landed launches in September. Due to the dearth of new projects, the sales booked in October came largely from previously launched residential developments including Affinity at Serangoon and Stirling Residences. Developers sold 487 new private homes (excluding Executive Condos) last month – down by 47.7% from the 932 units transacted in September. Colliers noted that the new private homes sales for the first 10 months of 2018 have hit 7,446 units, and is on track to meet its full-year forecast of 8,500 – 9,000 units as more new projects are expected to be rolled out by developers before the end of the year. 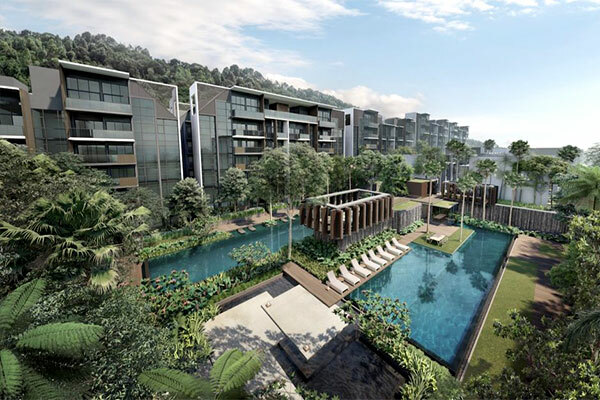 It noted that new launches Whistler Grand, Kent Ridge Hill Residences and Woodleigh Residences have reportedly sold 160, 116 and 30 units respectively in early November. On a year-on-year basis, developers’ sales in October were down 36% while those for the first 10 months were down 21.3%. There was only one new launch in October – 10 Evelyn, which sold two units at a median price of SGD2,478 psf. This project has only 56 units. Colliers said that the best-selling private residential projects in October were: Affinity at Serangoon which shifted 81 units at a median price of SGD1,499 psf; Stirling Residences which sold 75 units at a median price of SGD 1,738 psf; Riverfront Residences transacted 55 units at a median price of SGD 1,327 psf; and Park Colonial moved 52 units at a median price of SGD 1,754 psf. “Affinity at Serangoon saw its best month of sales since its launch in June, selling 81 units to bring its total takeup to 268 units. We believe the pick-up in sentiment was due to the developer’s discount in pricing to below SGD1,500 psf from SGD1,584 psf in June. Continued takeup at stable prices at the recently-launched projects such as Stirling Residences, Park Colonial, The Tre Ver and JadeScape underscored the genuine demand in large city-fringe projects that offered ample facilities and near MRT stations. Projects that are priced affordably below SGD1,400 psf such as Riverfront Residences and The Tapestry in the suburbs also have their fair share of supporters. Generally, developers are holding onto pricing while some are flexible to adjust pricing in selective areas that are more competitive. EC sales nearly doubled from September, reflecting the continued appeal of this housing type which is a hybrid of public and private housing. Developers sold 23 ECs in October, up from 12 in the previous month. We think there continues to be pent-up demand for ECs owing to their relatively more affordable price-point compared with private condos. Their popularity and limited EC stock in the market have played a considerable part in driving strong interest for EC sites in Government Land Sales tenders. Rivercove Residences have consistently sold at prices around SGD1,000 psf since its launch in April 2018. Colliers said that it expects new private homes sales to continue to fluctuate from month to month in tandem with the number of projects being launched. It had previously indicated that given the sizable supply pipeline from Government Land Sales and collective sale sites, developers are likely to be more cautious and may pace out their launches to ensure the market remains sustainable. Colliers added that as the year winds down, developers will have a small window to put out new projects before market activity slows during the year-end festive period. Some new launches that could feature in the coming weeks include Parc Esta and Mayfair Modern.